News of the new trans-European Eurostar from the Daily Telegraph. 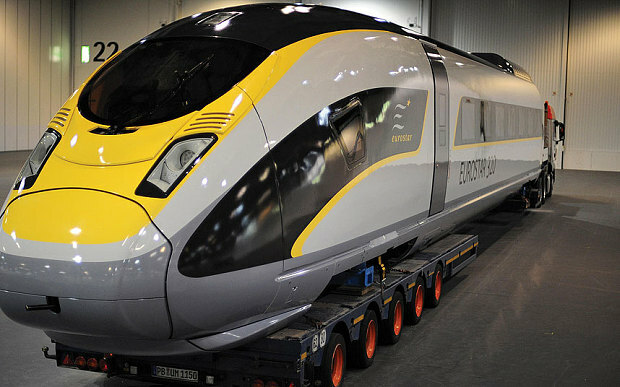 A new 200mph state-of-the-art train has been unveiled in London by Channel Tunnel high-speed train company Eurostar….. The trains are described as being “inter-operable”, meaning they can run across diverse European signalling systems, opening up the potential for a whole range of new direct services between the UK and European city centre destinations…. May 2015 will see the start of a new year-round direct Eurostar service to Provence, stopping at Lyon, Avignon and Marseille, followed at the end of 2016 by the launch of a direct route to Amsterdam with stops in Antwerp, Rotterdam and Amsterdam’s Schiphol airport along the way. So in 2017, I could go to Eurospoor by Eurostar! I see that they have taken a different approach to Hornby’s Brighton Belle – the wheels are smaller to get it round 9″ curves. I’m sure Kato will have no problem, though, when their model comes out.